Theme weddings have been on the rise recently. Themed weddings can be quite meaningful to a couple because it can take a concept or idea that is important to the couple and fuse that with the wedding concept or ideas. If a couple is thinking about having a theme wedding, and doesn't know what kind of theme they would like. some ideas could be: a special place for the couple like the beach or a farm, a TV show or movie that united them such as Downton Abbey or Dr. Who, a hobby or interest like Vineyard or even Circus, or a profession the couple shares like police officer or teacher. 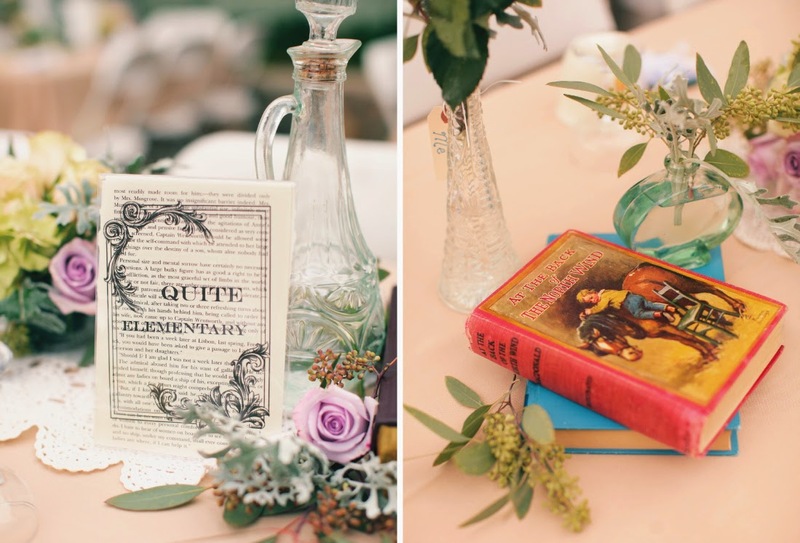 For a couple who enjoys reading, or if one or both of the people are librarians, a Literary or Book themed wedding is a fun way to go. 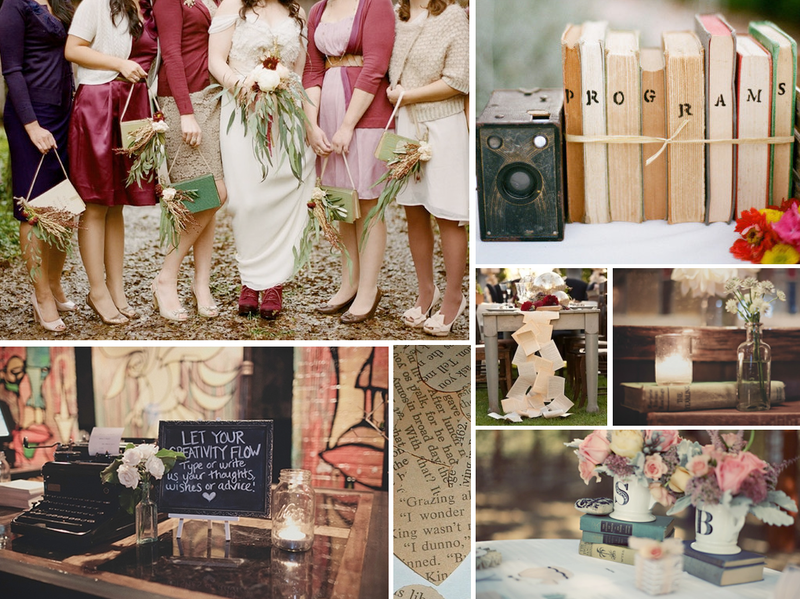 A literary wedding can be modern or vintage and any color scheme can be chosen. 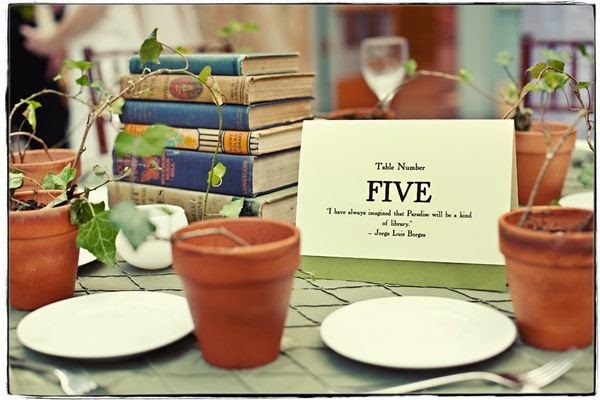 You can have a heavy literary theme using books and the written word blatantly in many aspects of your wedding, or you can a lightly hint at a literary theme. 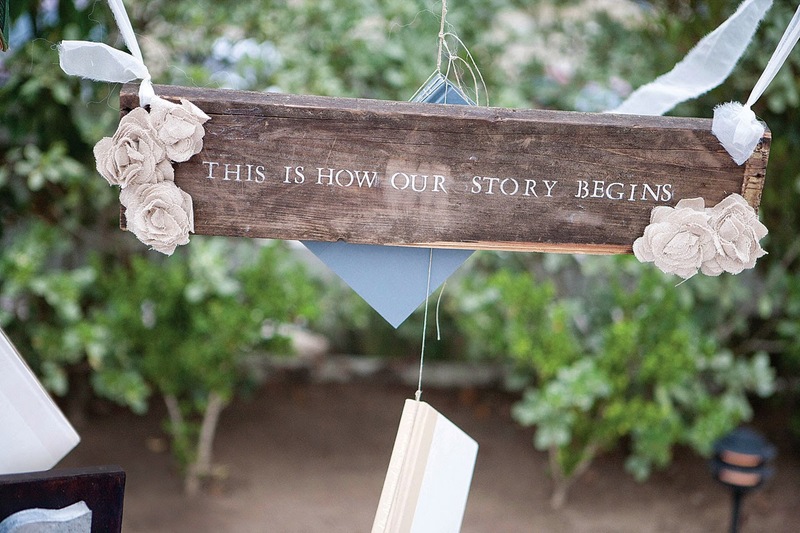 Although a literary themed wedding is not a very common idea, it has been done before. There are many ideas online about how to have a literary theme, such as Pinterest, which can be of great help. 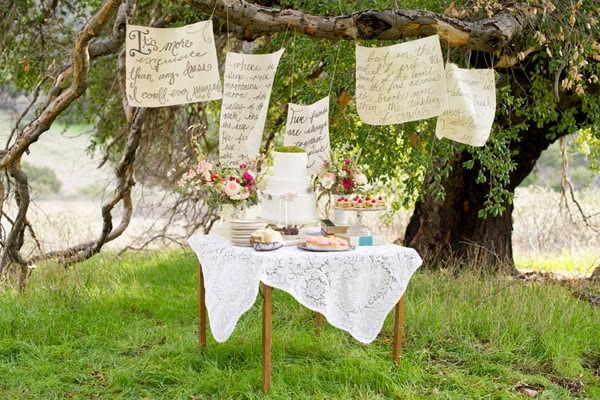 In this article I have helped you out by sharing some of the ideas I used in planning my own Literary Themed Wedding last year as well as other ideas I have found and come up with. Save-the-Date cards or Wedding Invitations are a great place to start showing people your theme. While not everyone sends Save-the-Date cards to let people know when their wedding will be head of time, people are sending them more and more. Both your Save-the-Date and invitations can fit the theme. For our Invitations we worked with a designer, for only fifty dollars, at a local print shop and were able to get a personalized card that met our theme. In the background of Our invitation looks like an old book page, which the designer took from The Lord Of the Rings, one of my husband's favorite book, and on the foreground of the invitation is the wedding information printed in white on a black chalk board background in vintage font. Other ideas could be to use a picture of a library card, which we did on our wedding programs, use the image a stack of books, an entire bookcase, or an open book. 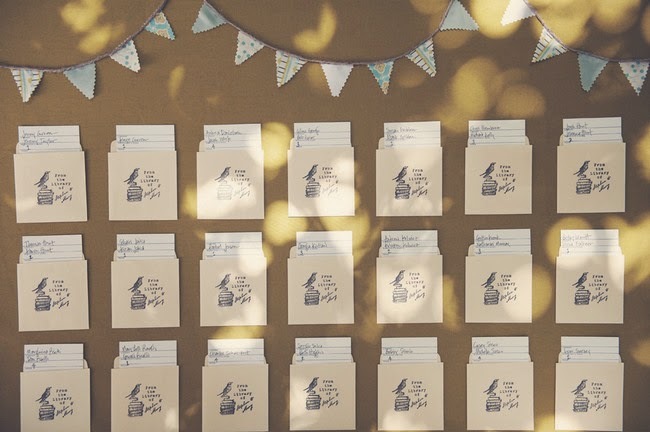 If you have the money and time you can make each invitation into an actual small book. The best way to show your theme is to have your cake made into the shape of a stack of books. This doesn't look as nice when it is not done in fondant. We had a baker that came with our hotel package who didn't use fondant so we couldn't have a book cake like we had wanted. So our cake didn't fit the wedding theme, but we were able to find a huge faux book box that we set the cake on top of. Or for a more subdued incorporation of the theme I have seem cakes with beautiful detailed script decorating it. When first envisioning this theme for my wedding centerpieces were the first thing that came to mind. I thought of a stack of two or three books with a low and wide vase of flowers sitting on top of them. After checking the internet I found out it was not an original idea. We used both real hardback books, most of them classics, and also faux box books. This was not inexpensive, but we both wanted a collection of books and the book boxes come in handy for all kinds of things. Amongst the flowers in the vase above the stack of books our florist mixed paper roses make out of a Virginia Woolf book I had given them. Other ideas for centerpieces could be a an entire bouquet of flowers made from books, wine bottles decoupaged with pages of books, or a candelabra sitting on a stack of vintage books. Or venue was in a hotel, but while planning the wedding I had also thought of a few other places for the wedding. Even though it would be hard to arrange, a library or bookstore would be the best place for a literary wedding. A local independent bookstore might be able to accommodate people more than a chain store. And even though I never found out I thought a great idea instead of a limousine taking the couple from the wedding site to the reception site, that a local bookmobile would be a great idea. Other things we had fit our theme were the bouquets and boutonnieres had flowers had book pages incorporated in them, we had bookmarks for favors, guests signed library cards instead of the traditional guest book, and during the reception guests were invited to write down suggested reading in a decorative book.